You made it to spring break!! Hope you all have a fun relaxing break!!! This chapter begins with a short story about a white dove (symbolism of beauty and peace-something/someone who seems to have it all) being lost. The white dove approaches a black crow and asks where a particular path goes because they are searching for the path to happiness. The black crow responds that all paths are really one connected path-possibly indicating that everyone in this world is on the same search to happiness. I believe Naoki included this short story as a reminder that everyone in this world is on the same path and ultimately just wants to achieve happiness. Why do you need cues and prompts? Naoki says that people with autism are sometimes unable to move to their next action without a verbal prompt. For example, even after someone with autism requests a glass of apple juice they are unable to actually drink it until they are provided with a verbal prompt. Naoki says that his brain is wired to move from one action to another only when provided with prompts. He compares his brain needing prompts like people need a green light while driving to “go”. Why can you never sit still? “I’m always on the lookout for an exit. But even though I’m forever wanting to be someplace else, I never can actually find my way there.” Naoki also says that he is more relaxed when he is in a state of motion as opposed to sitting still. Short answer-Naoki says no! He says that visual schedules are too restricting and stress him out about where he needs to be and when. Naoki suggests talking through the day’s plans with him instead of giving him a visual schedule. He suggests talking through the fact there may be changes to this routine as well. Naoki says that it is often misunderstood that people with autism do not understand just by listening. I found this statement significant because I honestly find myself doing the same. I have assumed with certain student’s that they require visuals to really understand my message or intent. On the other hand, I am often surprised when one of my student’s picks up on something that I said when I really didn’t’ think they were listening. My students are often looking away or engaged in another activity as I speak and I need to remind myself that they are taking in more than I may realize. I also think that this response about visual schedules may be specific to Naoki. Obviously everyone with autism is different and I have definitely seen the benefits of visual schedules as opposed to verbal reasoning and explanations. What causes panic attacks and meltdowns? Naoki says many things may cause them and sometimes they are just unavoidable even with an ideal environment. Naoki suggests letting the panic attack (screaming and yelling) just happen and stay close by to ensure everyone is safe. –I think that this response is difficult to accept when working in a school setting because one student’s meltdown often triggers another student and it turns into a domino effect! Naoki mentions all of the turmoil and crisis in this world today and suggests that people with autism are here as a reminder of “what truly matters for the Earth”. I just wanted to share a link with you all today! I won’t say too much about it, just that I would love for you to share your thoughts in the comments below! Sorry and thanks for your patience! In the beginning of this chapter Naoki speaks of witnessing others cry and wondering why they are crying. He describes his own experience when he visited a town called Kamakura and the great statue of Buddha caused him to burst into tears. He explains that it was more than just the majesty and dignity of Buddha, it was the weight of the history and generations of people’s hopes, prayers and thoughts that broke over him. He felt as though Buddha said to him, “All human beings have their hardships to bear, so never swerve from the path you’re on.” He also reminds the reader to remember that crying isn’t always about sadness or meltdowns. Q48 Why are you always running off somewhere? He explains that he doesn’t choose to run off and is constantly working to fight the impulse. He compares it to being teleported from one place to another without even knowing it. Q49 Why do you get lost so often? Q50 Why do you wander off from home? The answer to this question is described as his “body moved because it was lured outside by something there.” One time he was almost hit by a car and the fear had such an impact on his memory that he stopped running away after that experience. Q51Why do you repeat certain actions again and again? In his opinion, people with autism do not do this simple because they enjoy it, but because their brains send out the same order over and over and there is comfort and good feelings that come from it. He envies people ability to know what their minds are saying and have control over it. He feels as if he has to obey the missions that his mind sends to him. Q52 Why don’t you do what you’re supposed to do, even after being told a million times? There is a sequence that happens and no matter how many times he’s told not to do something, the impulse to re-create that sequence takes over and sends some type of pleasant electrical buzz to his brain. He compares it to watching your favorite scene of a DVD over and over on auto repeat. Q53 Why are you obsessive about certain things? Obsessing over certain things happens because they like it or because it causes them to be calmed or soothed. He mentions that people should try and stop the behavior if it is disruptive or bothersome, but if it isn’t, then just let them be. I am feeling inspired after the SLP Summit and ready to put some of the speakers’ therapy ideas in action! I have had a chance to apply several ideas. For example, I introduced new visual support and questions to teach critical thinking skills to older students. As a result, the students seem more engaged and eager to participate. 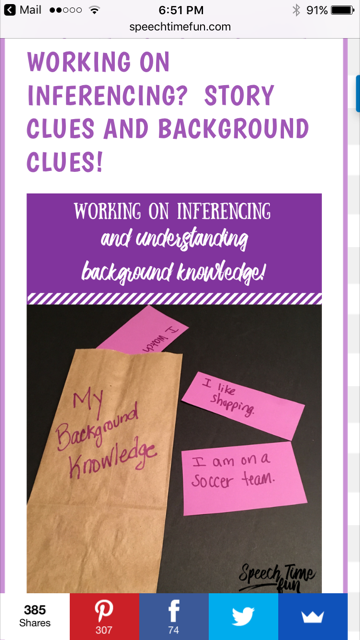 I introduced some other new visuals and asked new questions to teach inferencing, sorting relevant and irrelevant information, context clues, sequencing, and compare/contrast. I’ve used a lot of sticky notes and diagrams to add a new twist to teaching the same skills. I have seen better attitudes among preschool students since I modified the classroom structure. I look forward to implementing other ideas discussed, such as graphic organizers to teach vocabulary and learning visuals for behavior management. Overall, I have enjoyed trying out some new ideas. I think the students have found it just as refreshing! Why do you memorize train timetables and calendars? Naoki explains that it is fun to memorize schedules and calendars. He stated that numbers are fixed and unchanging, following the same set of rules unlike trying to interpret human relationships and ambiguous expressions. I have kiddos on my caseload that remember birthdays of peers and classroom staff. This information is constant and unchanging, allowing them a clear way to engage in social interaction. Do you dislike reading and picking apart long sentences? Naoki states that he enjoys dissecting sentences but his patience wears quickly and he loses the meaning of the sentence. Naoki enjoys learning but people with autism need different strategies and approaches to help them learn. We see this in every individual on our caseload. 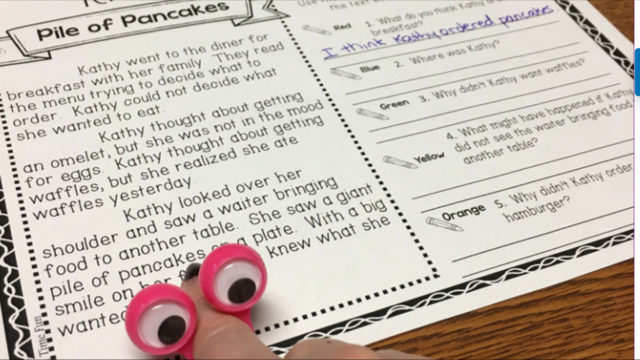 We use a variety of specially designed instruction to ensure our kiddos can effectively communicate in a classroom environment. What do you think of running races? Naoki does not hate running but when placed in a competitive situation, he states that he overthinks the movement of his arms and legs and does not enjoy beating others. This question resonated with me. I was outside with one of my classes when I witnessed one student running quickly around the track. When the teacher suggested a race between other peers, the student refused to participate stating, “I can’t run that fast.” I was hoping a race would be a great way to focus on social skills. My initial thought was this student does not want to lose, but after reading this chapter my perspective has changed. Why do you enjoy going out for walks so much? Naoki stated the obvious reasons like “walking makes you feel good” or “it is great being in the open air” but, for people with autism, their fondness for nature is different. Naoki describes his body feeling recharged when outside. Do you enjoy your free time? Naoki explains that it is hard for people with autism to find something they want to do. People with autism tend to gravitate toward activities they can do. Playing with familiar items is comforting to people with autism because they already know what to do with the object. I see so many of my kiddos during free time do the same activity. One of my students likes to draw and another likes to listen to the same song repeatedly. –Kim Campbell, SLP at Valley Prep and Stonestreet Elem. *Overall it does not seem to save much time. The only thing that we can really use it on is the communication written report because it is more lengthy. The other forms just require a few sentences that we can type quickly. *When copying and pasting from Word in Dragon speak to Infinite Campus apostrophes become “?” And have to be edited. Using the dictation pad is better for this. *We cannot use either program to type directly into IC. We have to use Word, Google Docs or the dictation pad (in Dragon) to dictate and then copy and paste into IC. This is just another step that takes a little more time. I had very similar issues. After talking with Shaneh, I did not seem to have quite as many errors using the google docs, other than with student names. In comparing the two programs, I feel that google docs was fairly simple to use, but it was definitely not a time-saver based on the issues Shaneh mentioned. If our reports had more of a narrative style, I do think it would save time. With opening and closing several documents, I found it easier to just type and use copy/paste to complete our forms. The other big issue for me was finding a quiet place to use the program. Based on this information and what you already know about dictation programs, would you be interested in a summer PD dedicated to either or both of these programs? If so, please comment below!